Ride. Walk. Bike. St. Clair County Transit District delivers. The St. Clair County Transit District (SCCTD) was created in 1981 under the Illinois Mass Transit District Act. SCCTD provides and manages transportation services for the fifteen townships that make up the District. 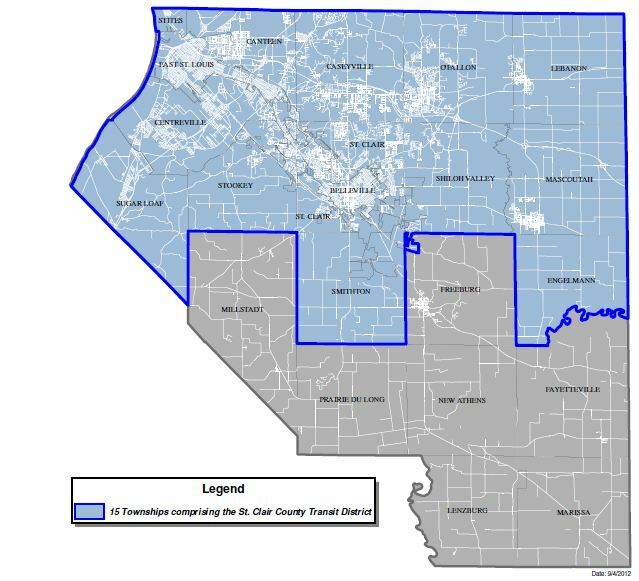 The fifteen Townships in the District include: Belleville, Canteen, Caseyville, Centreville, East St. Louis, Engelmann, Lebanon, Mascoutah, O’Fallon, St. Clair, Shiloh Valley, Smithon, Stites, Stookey, Sugarloaf. The SCCTD is a special purpose unit of local government that is empowered to collect a .75 percent sales tax within the District for the purpose of providing public transportation and connecting facilities like MetroBikeLink within the District. St. Clair County’s local investment of $339 million delivers access to a $1 billion transit system including MetroLink, MetroBus, Paratransit Alternative Transportation Service (ATS) and MetroBikeLink.